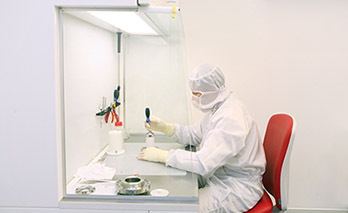 Our comprehensive clean room validation report describes in detail the raw data acquired from our test results and measurements taken on site. Our reports clearly identify whether or not a room or device meets the relevant standard. The cleanroom validation reports also include plan drawings of all the areas surveyed, showing HEPA Filter locations, airborne particle count positions, differential pressures, recovery rate locations and other information appropriate to the validation. Copies of calibration certificates are also included in all reports. Air volume flow rate readings are to ascertain the total volume flow rate serving a clean area. The air volume flow rates achieved are compared with design criteria (where available). Air change rates for the controlled areas will be calculated and reported Reference can also be made to the requirements and procedures detailed in BS EN ISO 14644-3 (2005). Independent pressure readings are taken to ascertain the difference in pressure between two areas, which confirms operator/product protection. If a direct reading is not possible, the differential pressure gauge tubing will be used. Reference can also be made to the requirements and procedures detailed in BS EN ISO 14644-3 (2005). Particle challenge (filter integrity) leak tests are carried out on HEPA filters to prove that neither the HEPA filter nor its housing permits the bypass of particulate to a level which exceeds the acceptance criteria and could compromise cleanliness or particulate control. HEPA filters are subjected to an artificial particulate challenge (DOP) and scanned to detect leaks. The Downstream side of the HEPA filter (media, housing, frame and seal) is scanned in overlapping strokes using a photometer probe (at a scan rate not exceeding 5cm/sec) to ensure that no bypass greater than the acceptance criteria is evident. Where scan testing is not possible, volumetric sample efficiency (by duct traverse sampling) will be taken and these results are detailed as an overall volumetric efficiency. Airborne particulate cleanliness tests are carried out to confirm the level of non-viable airborne particulate within the area under test and compare with the acceptable concentration levels for the class or grade of the area. The number of sample locations and sample volume at each location is calculated and established. The Particle Counter instrument then counts and records the levels of particulate at each agreed sample location. The particle count levels recorded, along with any statistical analysis (where applicable), are detailed on the individual printouts contained within our reports. Results are expressed in counts per cubic foot and also as concentration per cubic metre. Statistical analysis is expressed in concentration per cubic metre. The considered particles size(s) for classification and statistical analysis are detailed in our reports. Details of the requirements and procedures used are specified in BS EN ISO 14644-1 (1999). For EU GMP Grade clean area requirements, the procedure specified in BS EN ISO 14644-1 (1999) will be used for calculating sample volumes and locations, using the nearest ISO whole number Classification as the class reference. However, EU GMP concentration limits will be the overriding acceptance criteria (where applicable). Magnehelic/minihelic type pressure gauges are cross-check calibrated against a calibrated test instrument to ascertain the accuracy of the gauge. The reference tubing is removed from the installed pressure gauge and the pressure gauge is zeroed. Our test instrument is then connected to the Gauge’s reference tubing. Using this referencing pressure level connected to both the installed gauge and the independent test instrument, both pressure readings are recorded. The variation is also recorded and compared to the acceptable gauge tolerance. Multi point calibrations can also be performed where requested. If the installed gauge calibration is adjusted then the before and after adjustment figures are recorded and presented in our report. ISO 14644:3 contains a description of methods that can be used to obtain information on how quickly contaminated areas will recover from being contaminated. This is done by measuring the decay rate of airborne particles, the faster the decay the more clean air is demonstrated to get to the area being tested and the better the cleanroom is working.